The New York State Office of Children and Family Services and its Commission for the Blind and Visually Handicapped (CBVH) designated National Industries for the Blind (NIB), the nation’s leading employment resource for people who are blind, to administer the New York State Preferred Source Program for people who are blind. Effective December 1, 2012, NIB assumed the day-to-day management of the Preferred Source Program for eight affiliated nonprofit agencies for the blind in New York State. These agencies employ nearly 400 people who are blind and generate approximately $30 million in sales of products and services sold primarily to New York State and local government agencies. 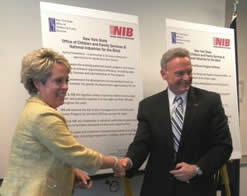 Officials from the New York State Office of Children and Family Services, which oversees the Commission for the Blind and Visually Handicapped, and NIB held a special signing ceremony yesterday to announce the designation. NIB, an Alexandria, Virginia-based nonprofit organization, brings nearly 75 years of experience supporting a similar, nationwide purchasing program for the federal government, known as the AbilityOne® Program. NIB works with 90 associated agencies across the United States to create and sustain employment for nearly 6,000 people who are blind. NIB will maintain an office in Albany, New York, and will manage order processing, customer service, sales, and accounting functions for the New York State Preferred Source Program for people who are blind. The New York State Preferred Source Program for people who are blind is a statewide initiative to create and sustain employment opportunities for New Yorkers who are blind or visually impaired. State and local agencies are required to purchase certain products or services made by people who are blind who work at affiliated nonprofit agencies in New York State. Sheila Poole, OCFS Acting Executive Deputy Commissioner, and Kevin Lynch, President and CEO of National Industries for the Blind (NIB), shake hands to celebrate the agreement. In photo at right they are joined by others from OCFS, CBVH and NIB who were involved in reaching the agreement as well as many affiliates for the blind including Association for the Blind and Visually Impaired (ABVI) - an Affiliate of Goodwill of the Finger Lakes, Association for Vision Rehabilitation and Employment Inc. (AVRE), Olmsted Center for Sight, Northeastern Association for the Blind at Albany, Southern Tier Association for the Visually Impaired, VISIONS Services for the Blind and Visually Impaired, NYC Industries for the Blind. The Office of Children and Family Services (OCFS) serves New York's public by promoting the safety, permanency and well-being of its children, families and communities. OCFS achieves results by setting and enforcing policies, building partnerships, and funding and providing quality services. OCFS is dedicated to improving the integration of services for New York’s children, youth, families and vulnerable populations; to promoting their development; and to protecting them from violence, neglect, abuse and abandonment. The agency provides a system of family support, juvenile justice, child care and child welfare services that promote the safety and well-being of children and adults. For more information, visit http://www.ocfs.state.ny.us. The New York State Commission for the Blind and Visually Handicapped (CBVH) provides vocational rehabilitation and other direct services to legally blind New York State residents, including children, adults, and elderly persons. One of CBVH's primary objectives is to assist consumers in achieving economic self-sufficiency and full integration into society. CBVH offers these services from seven district offices across the state. For more information, visit http://www.ocfs.state.ny.us/main/cbvh/about.asp. For nearly 75 years, National Industries for the Blind (NIB) has been focused on enhancing the opportunities for economic and personal independence of people who are blind, primarily through creating, sustaining and improving employment. NIB and its network of 90 associated nonprofit agencies nationwide serve as the largest employer for people who are blind by the sale of SKILCRAFT® and other products and services through the AbilityOne Program, established by the Javits-Wagner-O'Day Act. For more information, visit www.nib.org.